PONSHOP Studio is excited to announce the second month of “Art for Park” – a skateboard art show to benefit the Fredericksburg Skate Park Project. 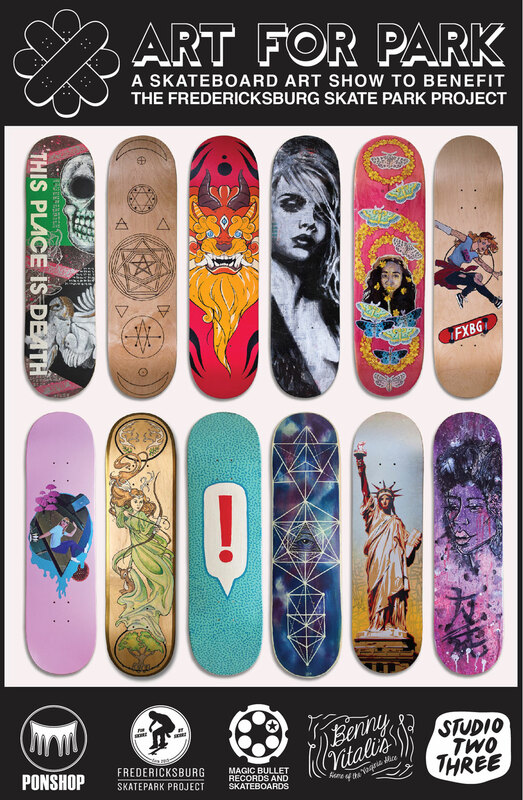 Over fifty local and national artists have transformed the standard street skateboard deck into a work of art for the walls (or for wheels). To usher in April’s First Friday opening reception, PONSHOP is teaming up with Richmond-based non-profit, Studio Two Three, who will be offering screen-printing activities via their mobile print truck stationed in front of the gallery. Our neighbors at Benny Vitali’s (722 Caroline St.) are contributing to the community effort by throwing a “Dough Raiser” on Thursday, April 5 (11am-11pm) contributing up to 20% of their proceeds towards the Fredericksburg Skate Park Project. “Art for Park” is a celebration of skateboard art and culture. What better way to rally the community than by having artists give their voice on what has, over the past fifty years, become an iconic symbol of youth culture and recreation. This is PONSHOP’s eleventh community art exhibit and we are collaborating with Magic Bullet Records and Skateboards and the Fredericksburg Skate Park Project to build community support for a better place to skate in Fredericksburg. We have a soft spot for the Saint Clair Brooks Memorial Park - the existing wood and steel ramps and concrete surfaces are dilapidated, weathered, and in desperate need of a renovation. “Art for Park” is the beginning of a sustained effort to raise awareness of the importance of skateboarding as both art form and recreation and to promote the Fredericksburg Skate Park Project. Initiated in 2013, this organization is dedicated to improving the existing skate spot at Brooks Park and promoting a safe and friendly public park for the entire community. Five Dollars of every Artist Registration and 20% of all deck sales will benefit the park initiative. As of this press release, “Art for Park” has raised $350 for the park initiative. Participating Artists Include: Sylvia Ortiz, Jonathan Ashe, Keyhan Lee, Gabriel Pons, HKS181, Drew Graham, Jeremy Gann, Malia Rae, Matt Corrado, and James Walker. On Sunday, September 22nd, we are taking part in hosting Toast of the Town Auction Benefit, a live and silent auction cocktail party at the Olde Silk Mill from 6:00 p.m. to 9 p.m. to benefit Rob Grogan. Rob Grogan is editor of the Front Porch Magazine, and has been diagnosed with Carcinoid Cancer. It is a rare form of cancer with lengthy and expensive treatment options. Since this spring, “Rob's Army” has been raising funds to help offset these costs not covered by insurance. Artist Betsy Glassie (by donating her painting "Perhaps Bonnard Will Come" 40x30 oil on canvas, for the Live Auction), and The Olde Silk Mill Inn owners, Ed & Anna Whelan (by donating their facility), have kicked off what promises to be the most exciting, fun, and must-attend event of the season. As of this Press Release, the event boasts over eighty pieces of fine art for auction from area artists and over ninety additional items for auction donated by local business and individuals. You may purchase tickets online, by check at Beck's antique shop, by check or cash at the PONSHOP art studio and gallery, or at the door. Make a Donation Here or Get Your Tickets now!